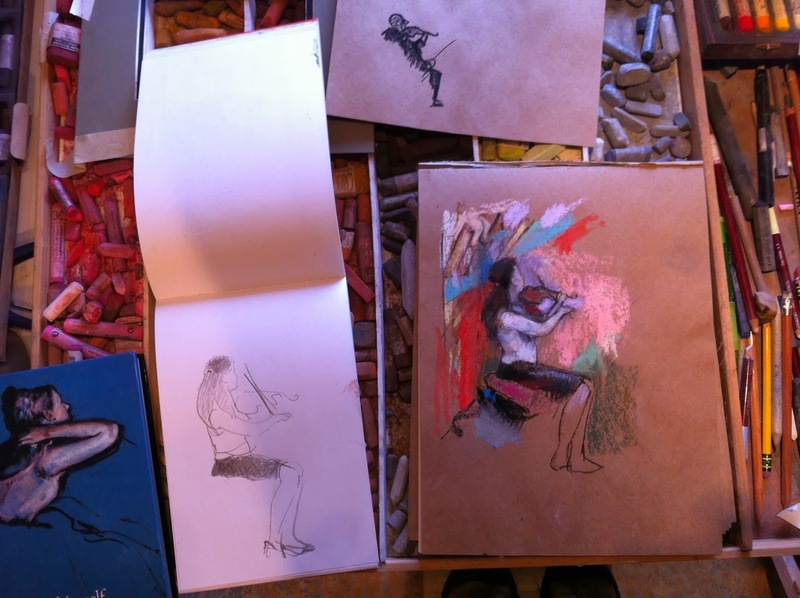 Degas book, original sketch from life, Degas study of a male violinist, and my working sketch on Bogus Rough paper. How interesting that the sketch I made at the Yellowstone Lake Hotel remains the best of the bunch, even after I have done several studies now to arrange it into a finished piece. I will keep at it. On another note, I have been trying to make my own ground now, off and on, for several years but have finally stumbled onto a workable surface, I think. It might be a life changing event. Claret paper. Not my own formula, but I did deviate from the recipe I was following. I'll let you know how it turns out. Claret Paper, in light blue and claret hues. I will credit the original recipe after I test this to see how it works. Years ago I attended a showing of Pissarro's work. In it was a collection of letters that he had written. One of the letters was to his son and told of a discussion he had had with Degas. Paraphrased it said that Degas had told him to observe and draw, make lots and lots of sketches while observing the subject, but that when he got back into his studio to only draw from memory. He felt that what was remembered was the truest and most important image. Love the first sketch too. Great advice, and I used it yesterday in the studio. Kind thanks.